Africa – the mother of all peoples on earth, was also where the first spoken languages were developed. The world’s 6,000 or so modern languages may have all descended from a single ancestral tongue spoken by early African humans between 50,000 and 70,000 years ago, a new study suggests. The finding, published Thursday in the journal Science, could help explain how the first spoken language emerged, spread and contributed to the evolutionary success of the human species. Quentin Atkinson, an evolutionary psychologist at the University of Auckland in New Zealand and author of the study, found that the first migrating populations leaving Africa laid the groundwork for all the world’s cultures by taking their single language with them—the mother of all mother tongues. “It was the catalyst that spurred the human expansion that we all are a product of,” Dr. Atkinson said. About 50,000 years ago—the exact timeline is debated—there was a sudden and marked shift in how modern humans behaved. They began to create cave art and bone artifacts and developed far more sophisticated hunting tools. Many experts argue that this unusual spurt in creative activity was likely caused by a key innovation: complex language, which enabled abstract thought. The work done by Dr. Atkinson supports this notion. His research is based on phonemes, distinct units of sound such as vowels, consonants and tones, and an idea borrowed from population genetics known as “the founder effect.” That principle holds that when a very small number of individuals break off from a larger population, there is a gradual loss of genetic variation and complexity in the breakaway group. Dr. Atkinson figured that if a similar founder effect could be discerned in phonemes, it would support the idea that modern verbal communication originated on that continent and only then expanded elsewhere. In an analysis of 504 world languages, Dr. Atkinson found that, on average, dialects with the most phonemes are spoken in Africa, while those with the fewest phonemes are spoken in South America and on tropical islands in the Pacific. 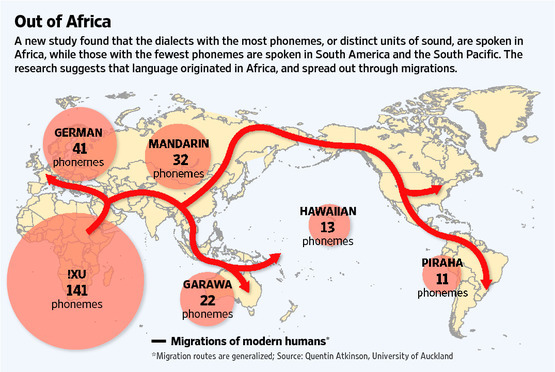 The study also found that the pattern of phoneme usage globally mirrors the pattern of human genetic diversity, which also declined as modern humans set up colonies elsewhere. Today, areas such as sub-Saharan Africa that have hosted human life for millennia still use far more phonemes in their languages than more recently colonized regions do.